Nick Enright was one of Australia’s entertainment legends: playwright, screenwriter, lyricist, as well as a theatre director, and actor. He died too soon at age 52, but left behind a large and impressive body of work and garnered awards and acclaim both here and overseas. Though he wrote several scripts for Hollywood and was inspired lyrically by the Illuminati of the American songbook – Gershwin, Porter, Berlin et al – his heart and voice remained true blue to his Aussie roots. Enright’s first foray into the thespian world was at age 21 when he stepped onto the stage of the Genesian Theatre, and he maintained a creative relationship with the small erstwhile church from then on. Enright On The Night is the Genesian’s way of giving back some of the love. 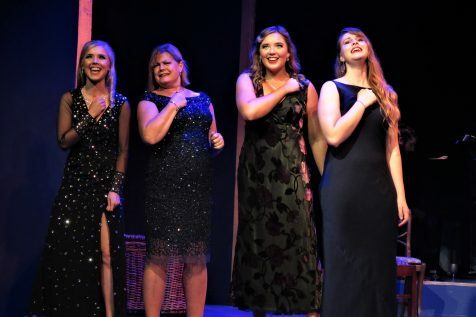 It’s a sort of revue featuring songs co-written by Enright and songs that inspired him, sung with charm, humour, and alacrity by four of the theatre’s favourite performers. Special guest and seasoned entertainer Angela Ayers, rising star Rosanna Hurley, and promising new talents Juliette Coates and Lana Domeney. The four ladies have a wonderful rapport, great voices, and sharp vaudevillian comic delivery. The songs vary in tone, from near slapstick to rollicking clap-along to tear-inducing ballads. Musical director, Dion Condack, plays accompaniment on the piano on stage, adding his own occasional cheekiness to the mix. It’s a truly uplifting night with fabulous songs and high-spirited performances that are infectious. A fitting tribute to a man regarded as much for his geniality as for his undeniable genius.